Over the last few weeks, I decided to take a deep dive into the practices of our top clients in order to distill their approach into a simple framework for what makes them referable. I always take meticulous notes when I see something that works, so I went over my notes from several hundred conversations with advisors from the past three years to see if I could discover something useful. It turns out that some of the best advisors consistently focus on 4 key areas of their business that determine everything else and significantly impact referrals. You have likely heard that 20% of activities generate 80% of results. This is called the Pareto Principle. Pareto noticed that 20% of the pea plants in his garden generated 80% of the pea pods and later showed that approximately 80% of the land in Italy was owned by 20% of the population. When you really start to look, you can see other examples of this principle almost everywhere. The 4 areas I’m going to share with you today make up the 20% of the work that generates an overwhelming 80% of results in your businesses. We started referring to these key principles as the Referability Quadrant. Some advisors think a referral strategy consists simply of a tagline in their email signature like the one below. That’s insufficient at best and dangerous at worst. It won’t actually drive sufficient volume of referrals and it is dangerous to make your business growth dependable on a single tactic that simply doesn’t work. 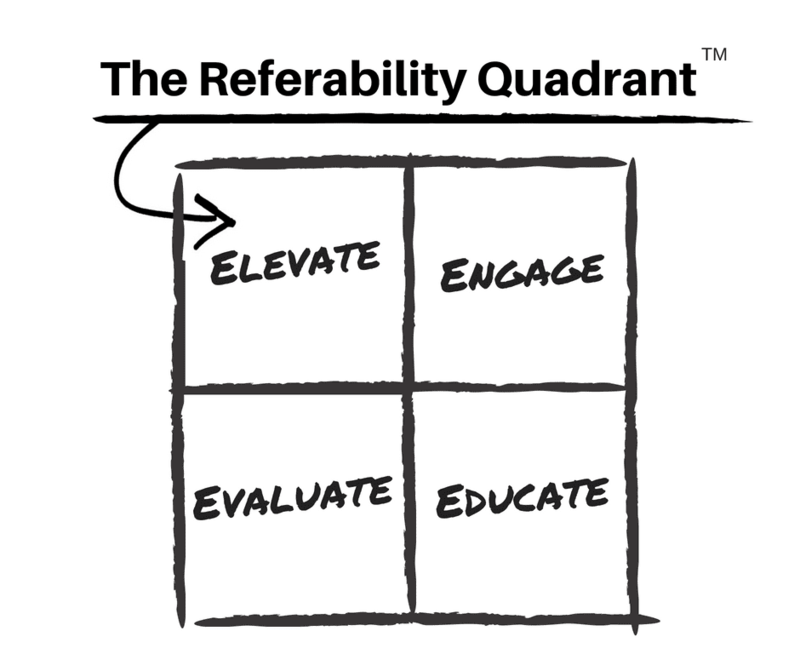 The Referability Quadrant is a systematic approach to structuring your business so you become more referable. It all starts with elevating your game and ends with evaluating your systems. Here’s how it works. Great advisors constantly improve their business. Period. They improve their systems and processes by designing useful workflows. They ruthlessly prioritize and apply technology to eliminate waste anywhere in the process. This instantly leads to more efficiency and time savings not only for the advisor, but also for their team and, most importantly, for their clients. Here are two quick wins you can implement today to elevate your game. First, schedule meetings online. Jason Pereira, an award-winning financial planner and senior financial consultant and partner at Woodgate Financial, Inc., recently shared an anecdote with me that perfectly exemplifies how this can have a huge impact on your practice. One of his staff members was spending nearly 70% of her time booking, rebooking, and confirming meeting times with clients over the phone. When they moved to an online solution to automate the process, they saved his staff and his clients a lot of time. In fact, he estimates they got that time spent booking appointments down to 20% of his staff member’s day. Suddenly, she had half of her day back that she could now spend on more productive tasks, significantly improving the firm’s efficiency. Similarly, his clients can now easily choose a time that works for them without having to play phone tag with anyone. Another way to elevate your game is to use face-to-screen technology to meet with prospects and clients. Face-to-screen technology has been said to be one of the most disruptive forces sweeping through the financial advisory space for several reasons. You’ll be surprised that not only do your out-of-town clients want to meet online, but that even some who live in town prefer it because it saves them time, too. After all, who wants to be stuck sitting in traffic? Clients appreciate advisors who value their time. As an advisor, if you’re easy to work with, you become way more referable. Top advisors optimize for client engagement rather than for customer experience in their financial planning process. According to Paulo Sironi, one of the most prominent minds in FinTech, customer experience can be copied or purchased and therefore quickly commoditized, so it isn’t a sustainable competitive advantage. Instead, you need to provide something of value. Show prospects what you can do for them in a way that clearly shows them the value you provide. Financial planning is a tremendous way to engage clients. In fact, in the quickly changing landscape of financial services, with at least one major shift underway (which we wrote about here), it is one of the few areas where you can predictably add value to each of your clients. Advice has to come before products. Financial plans should be the core of your client relationship. Do you understand the biggest financial worries of your clients? Are they thinking about a new roof or saving for their children’s education? What are their biggest questions about retirement? If you don’t know the answers to the above questions, you’re missing a great opportunity ‒ and your clients are missing out on a lot of value. Ask good questions and listen. There is really no magic about it. It’s just listening empathetically and trying to help your clients make better financial decisions. If you focus on their life, what matters to them, and their financial goals and challenges, you become an important and even integral part of their life and build a long-lasting relationship. This naturally leads to referrals. The key takeaway here is that investing in educating your clients pays off. Education is key not only when it comes to serving your clients and retaining them, but also in growing your practice. Don’t even think about a textbook approach to financial planning or 50-page financial plans, though. Rather, be practical. Educate clients about the specific impacts of their financial decisions and answer their biggest questions about their finances. What happens if they stay the course vs. following your advice? How long will their money last? How much can they spend without running out of money in retirement? When should they take their government benefits? Which of their assets should they spend first? Quick and meaningful what-if scenarios increase the level of understanding, which builds trust that then helps drive referrals. When clients understand what is going on in their financial plan, they’re actually excited to tell other people about what they know. This is how you generate referrals. In order to continue elevating your game, you need to create a feedback loop so you can see what is and isn’t working. Peter Drucker famously said “What gets measured gets improved.” See how that brings you back to elevating your game? Measuring results and identifying areas for improvement should be a regular activity, and collecting feedback from clients is a big part of that. However, that’s only half of the story. What you might not realize is that by creating a client feedback system, you receive referrals. Yes, the referrals can be a byproduct of your feedback gathering process if you implement it correctly. Grant Hicks recommends building an advisory board that includes your top clients so you learn directly from your best clients, and suggests having six centres of influence completely integrated with your business. Julia Chung and Sandi Martin show how they integrate working with other professionals and how referring out to the professional they think is best for each individual is a cornerstone of their business. It starts with laying out the ground work during the first meeting, creating an advisor evaluation form, reviewing the evaluation with the client, and creating a system to reach out (if you want to listen to him lay this process out in detail, you can listen from 13:00 to 22:00 of this podcast episode). By building feedback and referrals right into your evaluation process, you capture a big opportunity that many advisors miss. Focusing on these 4 areas will help you organize your advisory practice to maximize referrals and ultimately help more people achieve their financial goals. And I think this is what we all are here for ‒ to help Canadians make better financial decisions. If you’d like to learn more about how we approach addressing the 6 most common financial planning questions, here’s a quick video ‒ or you can always request a 1-1 demo with us here.